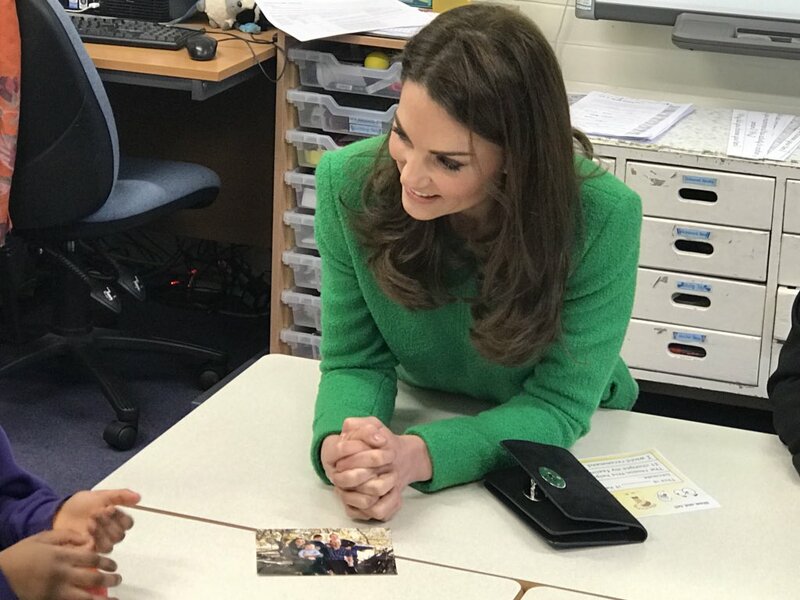 Today, the Duchess of Cambridge Catherine visited Lavender Primary School & Alperton Community School to find out more about support offered to students, teachers and parents to help with mental wellbeing. 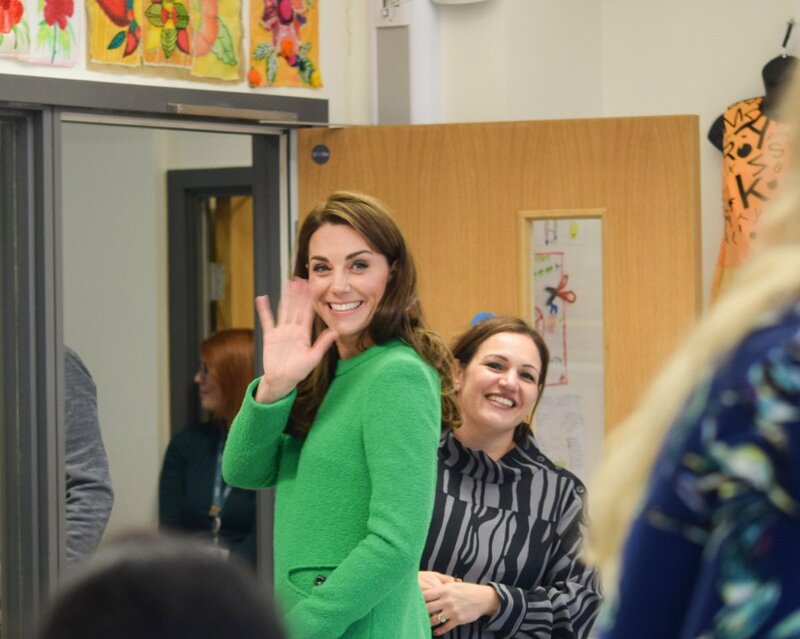 The Duchess first visited Lavender Primary School in support of Place2Be’s Children’s Mental Health Week 2019 and this year’s theme is ‘Health: Inside and Out’, focusing on the connection between physical and mental health. The charity works directly with more than 282 primary and secondary schools across England, Scotland and Wales. 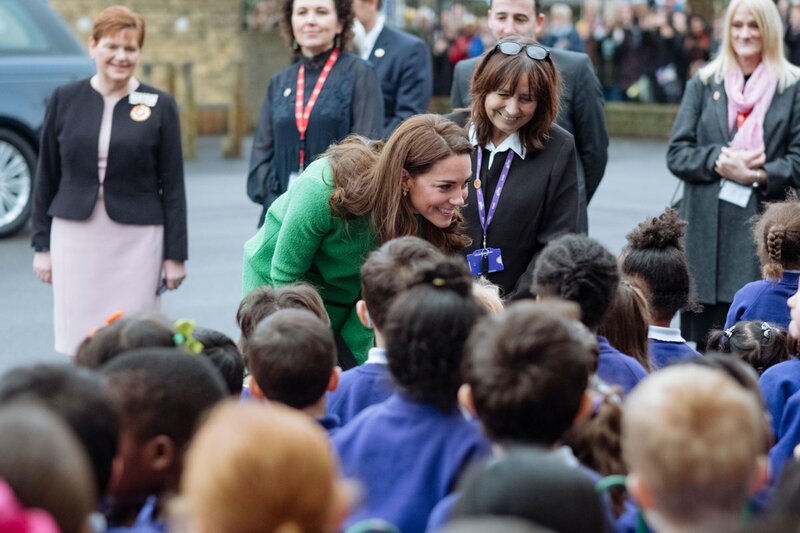 On her arrival, School kids welcomed Duchess with a song and a posy. 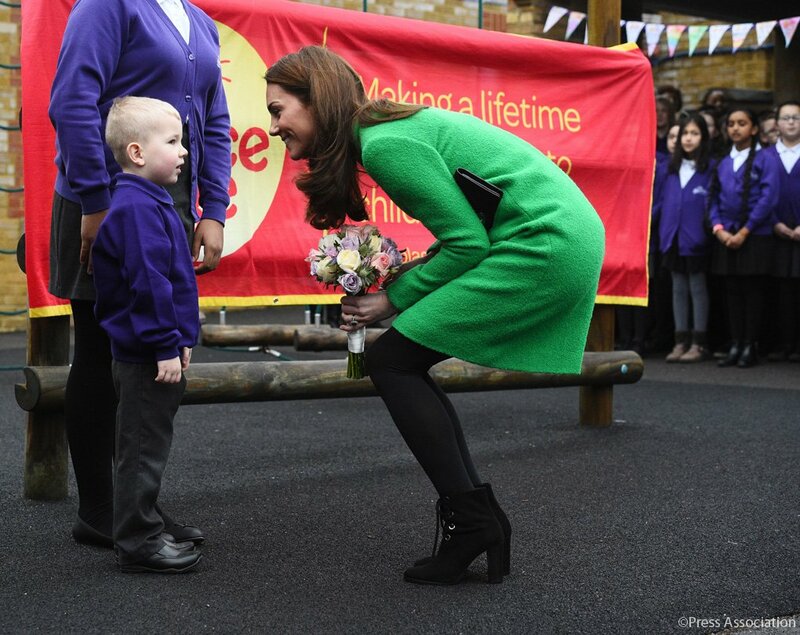 Duchess talking to the young kid who presented her with a posy. Mental Health and Early Year Intervention are one of the primary focus of Duchess’s Public life. Catherine is currently driving a research project to establish what more can be done in across the UK to give children their best possible start in life. 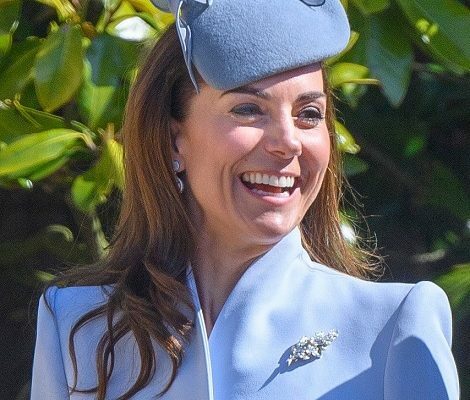 Duchess is working to highlight the importance of support to young people at the earliest stage possible, to tackle problems before they can escalate. In March 2018, The Duchess announced during a symposium at the Royal Society for Medicine that she has convened a steering group to look at what can be done to make a positive difference to the lives of children, by focusing on their earliest stage of life, from pre-birth to 5 years of age. The steering group’s recommendations, on behalf of The Duchess, will form the basis of The Royal Foundation’s strategy for developing her work in this area in years to come. 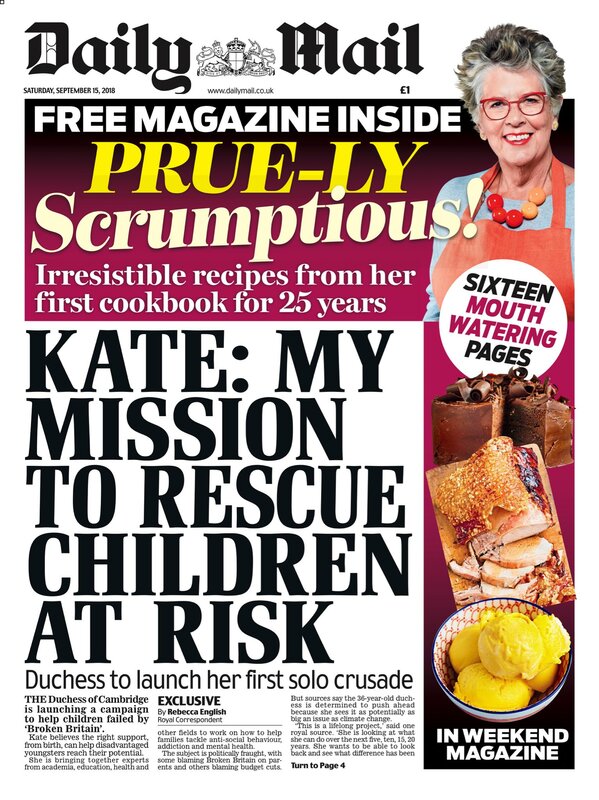 In August 2018, Rebecca English from Daily Mail reported that Catherine is set to launch her first “solo long term” project – a campaign to help children failed by ‘Broken Britain’ in 2019. She is bringing together experts from academia, education, health and other fields to work on how to help families tackle anti-social behaviour, addiction and mental health. As per the National Statistics records sixteen 10 to 14-year-olds took their own lives in 2017 and figures reveal suicide rates have tripled to hit a 35-year high. Experts believe early intervention is key – with more than half of all issues starting before 14 and 75% by 18. Read more about it here in Mirror Story. 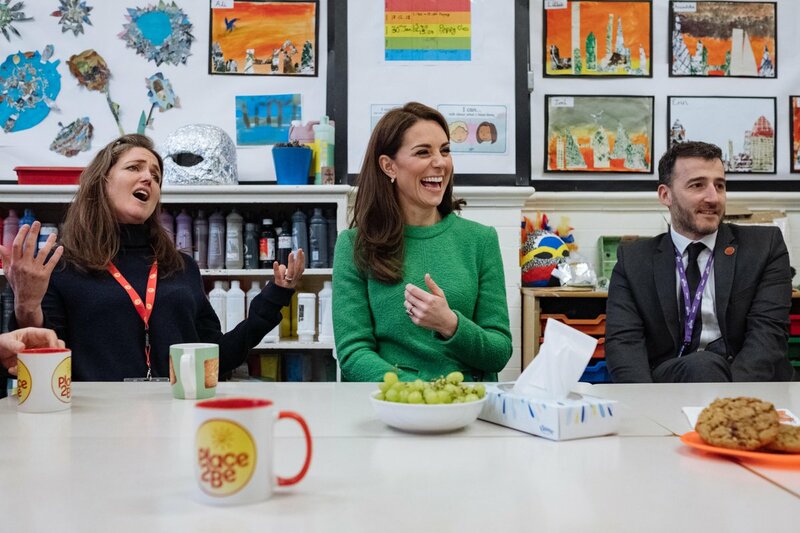 Place2Be, a patronage of Duchess, launched the first ever Children’s Mental Health Week in 2015 to shine a spotlight on the importance of children and young people’s mental health. 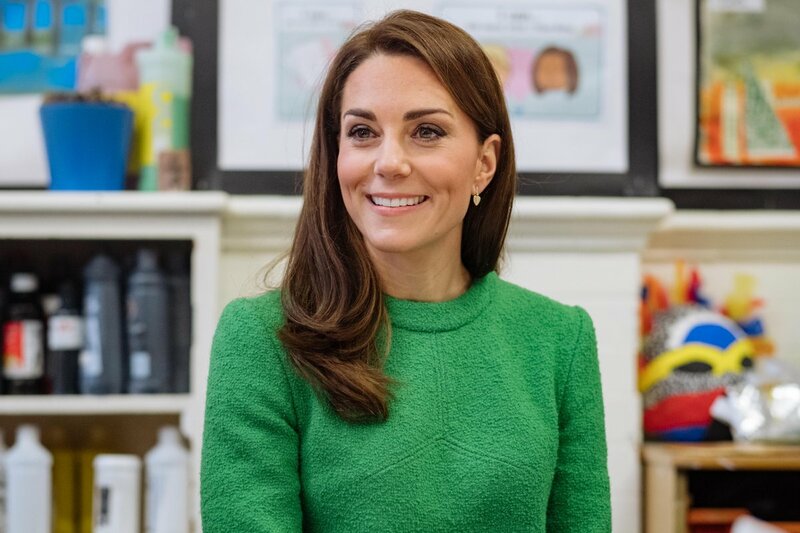 Last year Palace released a video of Duchess, marking the start of the poignant week by encouraging children to open up about their emotions. 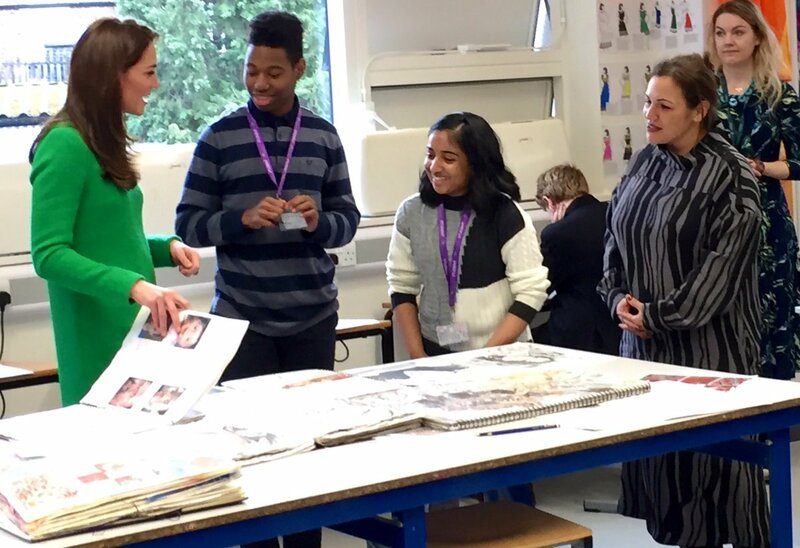 The Duchess spoke to pupils, parents and teachers about the importance of working together to support young people as they learn to be the best version of themselves . 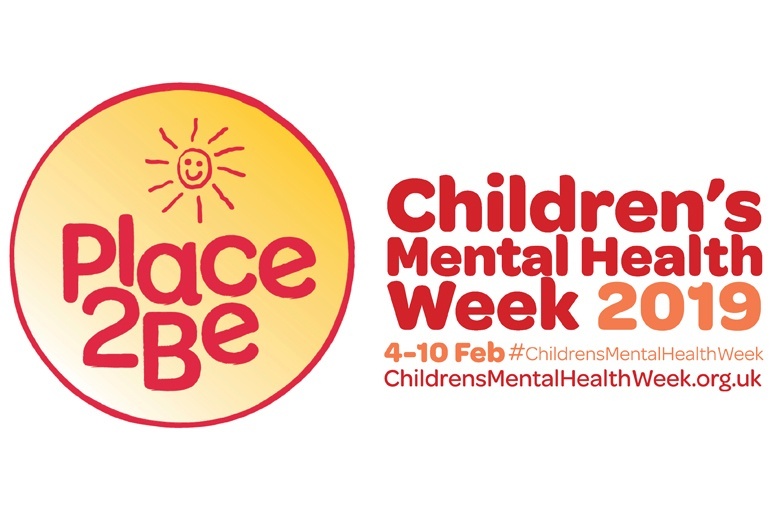 This year, Children’s Mental Health week is being celebrated by the Place2Be from February 04 to February 10. Place2Be is encouraging children, young people and adults to look after their bodies and their minds. Throughout the Week, schools, organisations and individuals across the country will be raising awareness and exploring how they can improve their physical and mental wellbeing. Learn more about the Children Mental Health Week and know how to get involve here. 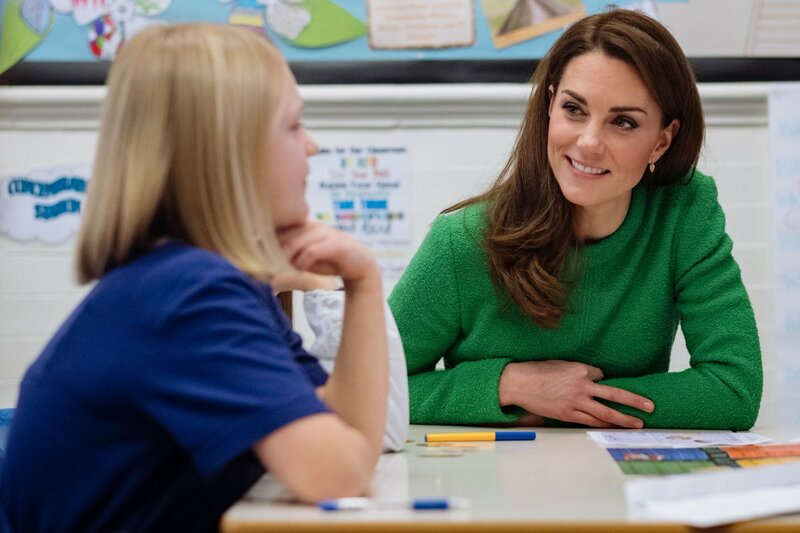 At Lavender Primary School, The Duchess met teachers and students taking part in Children’s Mental Health Week activities and sit in on two different lessons focusing on the importance of physical and mental health. 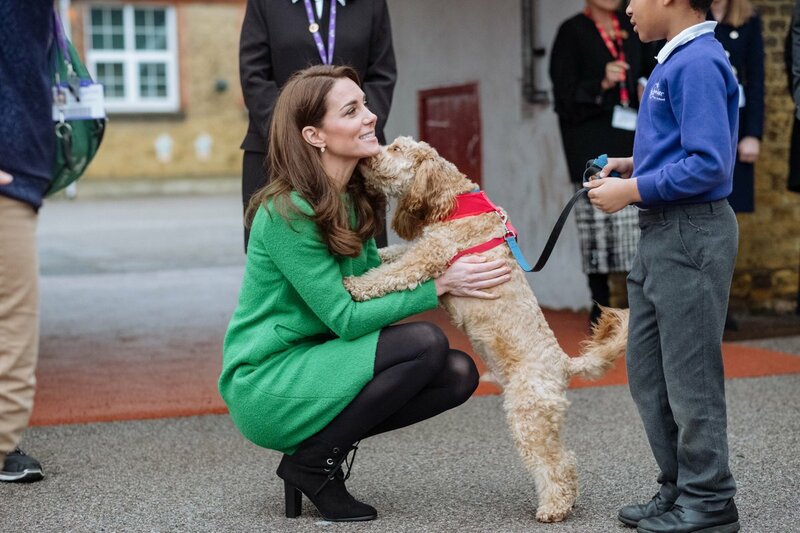 She also met with the School Dog little Herbie. Catherine also watched pupils taking part in the school’s Daily Mile challenge which teaches children about the importance of being active. The Daily Mile is a simple away to get children outside for 15 mins every day to run or jog at their own pace, making them fitter, healthier, and improving concentration in the classroom. 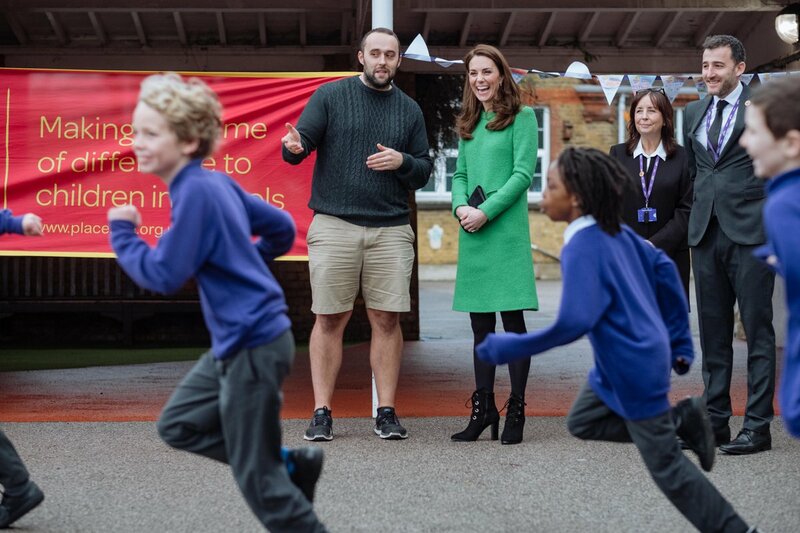 The Duchess spoke about its benefits with PE Teacher Mr Higgins. 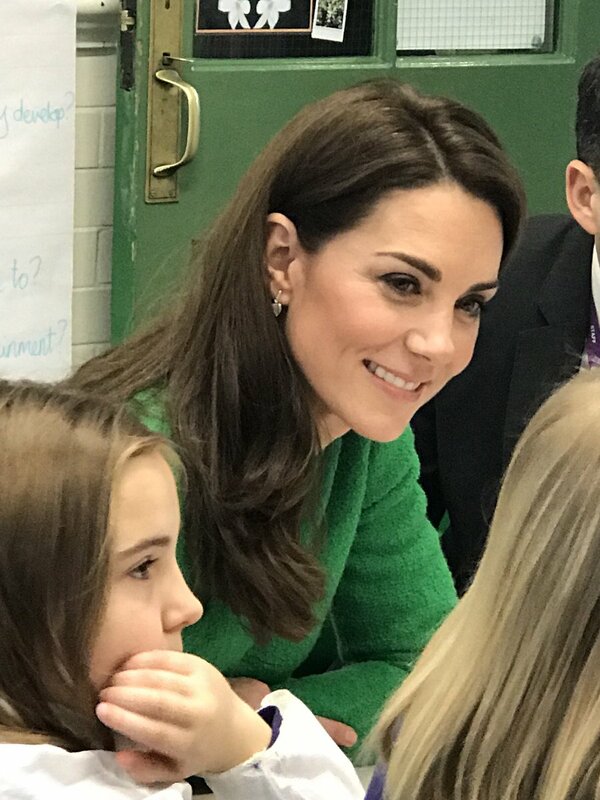 The Duchess of Cambridge joined Ms McGrath and Year 6 pupils for a food diary activity, which focuses on the links between food choices and mood and feelings. The ‘mood meter’ is a way to help pupils identify and plot how they are feeling. It works from left to right: less pleasant to more pleasant feelings and from bottom to top low energy to high energy feelings. Before departing The Duchess joined a group of parents talking about the challenges of putting in place good routines and habits around sleep, screen-time, healthy eating and exercise. 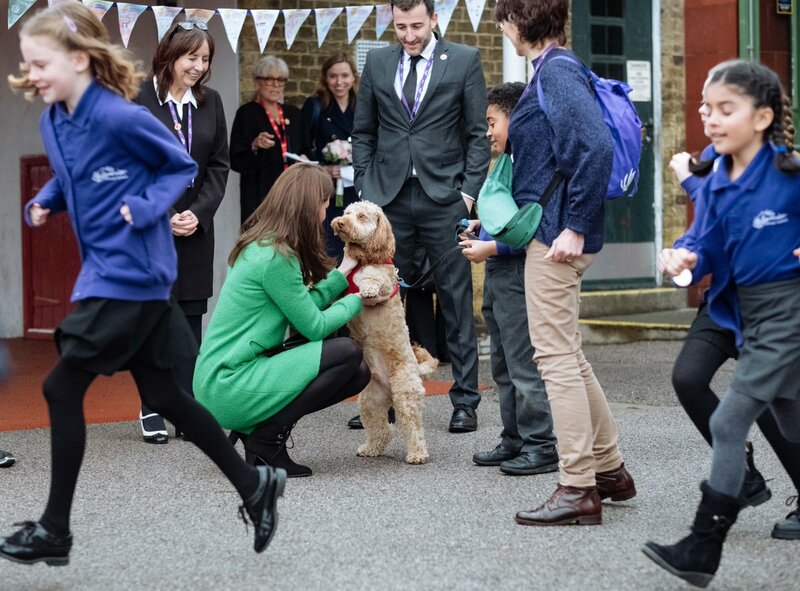 For the visit, Duchess was asked to bring an object that makes her happy to show the children at Lavender Primary School as she took part in ‘show and tell’ session of Charlotte Monk, an year 2 teacher. Duchess brought a family picture. 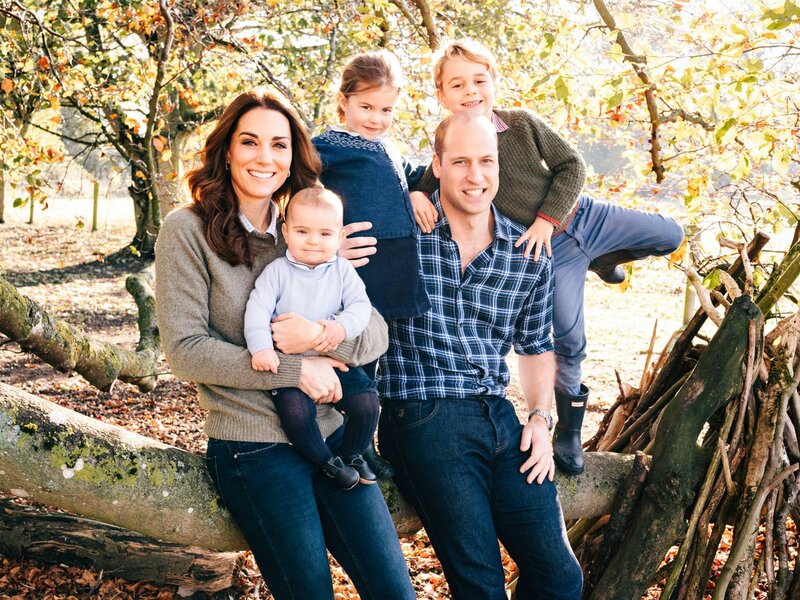 Do you remember this picture – it was the same picture that Palace released at the Christmas last year. 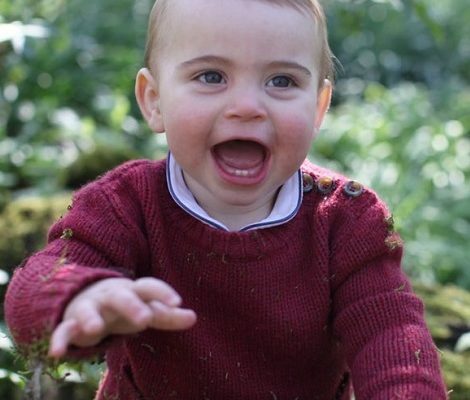 Rebecca English tweeted that during the visit, Duchess told that Princess Charlotte loves olives and that she encourages both her and Prince George to cook with her – they made cheesy pasta together the other day! New research released by Place2Be for Children’s Mental Health Week 2019 suggests that children with less sleep are more likely to struggle with worries. Children and young people who usually get less than the recommended 9 hours sleep on a school night are more likely to feel that worries get in the way of school work (32% vs 22%), according to a survey of over 1,100 10-11 year-olds and 13-15 year-olds carried out by Place2Be. 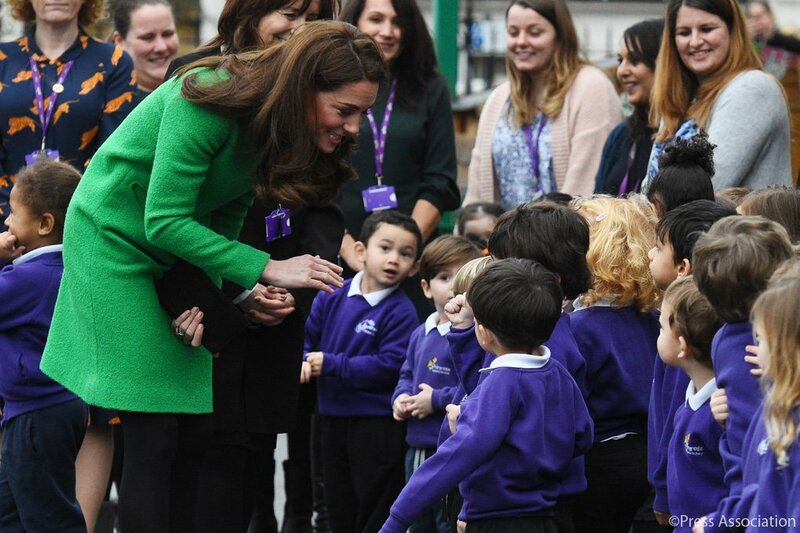 A video of Duchess’ visit to Lavender Primary School. 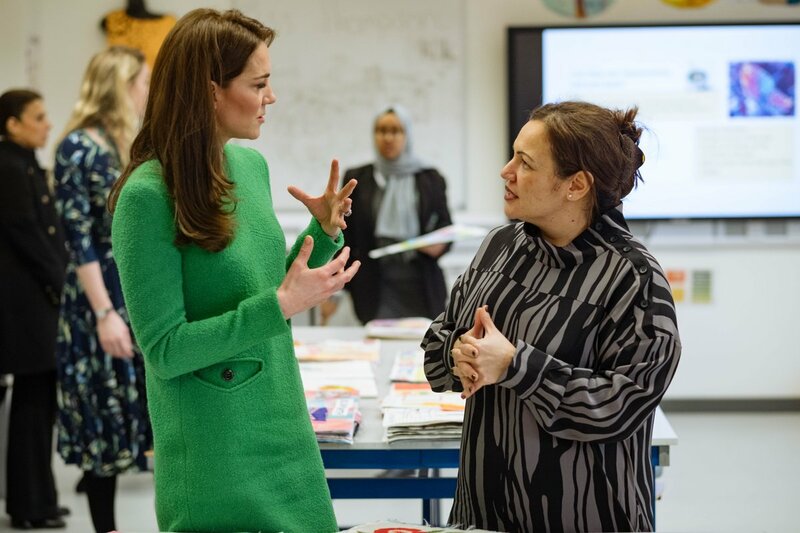 The Duchess then visited Alperton Community School to meet the UK’s first winner of the Varkey Foundation Global Teacher Prize, Andria Zafirakou, and find out more about the programmes the school runs to support both students and teachers with their mental wellbeing. Ms. Zafirakou won the Varkey Foundation Global Teacher Prize and £766,000 in 2018 in recognition of her contribution to the school community. The prize recognises an individual who has made an outstanding contribution to the teaching profession. The art and textiles teacher, who works at Alperton Community School in Brent, learnt how to say basic greetings in many of the 35 languages spoken at the school to help parents feel welcome. Ms. Zafirakou along with her colleagues also redesigned the curriculum to make it relevant to pupils. She is known for taking the time to understand students’ lives by visiting their homes. Ms. Zafirakou was awarded an MBE in the New Year Honours. 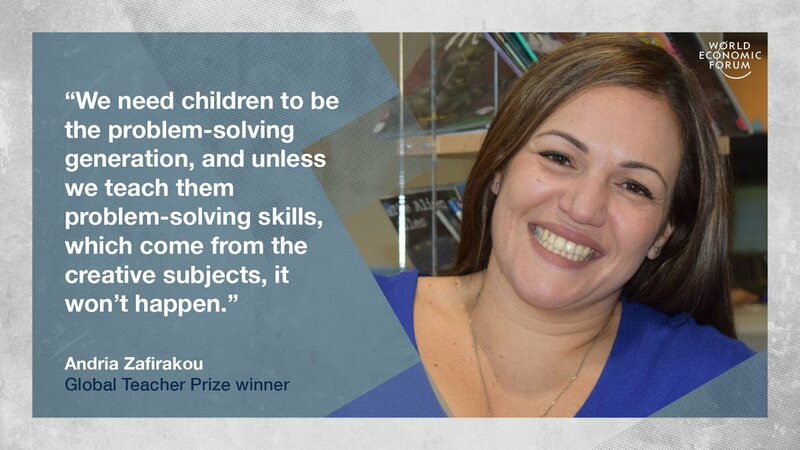 Speaking at the World Economic Forum Ms. Zafirakou said, “For me, it’s the fact that every child matters. Children are not robots, they have different learning needs that have to be met. Teaching should never finish with the bell – we are responsible for looking after the wellbeing and development of the child as an individual, it’s not just about the academic mindset”. Read more about her discussion on what matters to teaching here. On arrival The Duchess joined a roundtable discussion with teachers about students’ school readiness and teacher welfare. She then joined students taking part in the Random Acts of Kindness Club, which is an extra-curricular club focussing on the wellbeing of the school community. 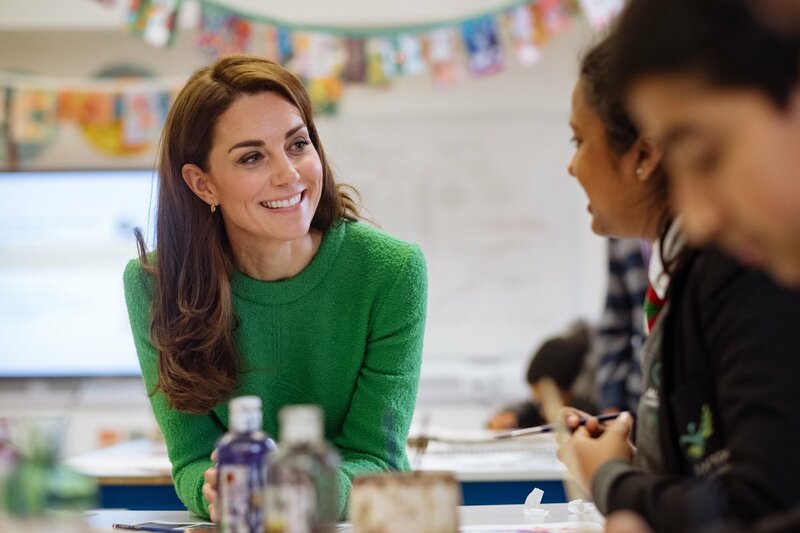 Before departing The Duchess dropped in an art class where she learnt how the school uses art to enhance children’s confidence and creativity. A beautiful shot of Duchess leaving. 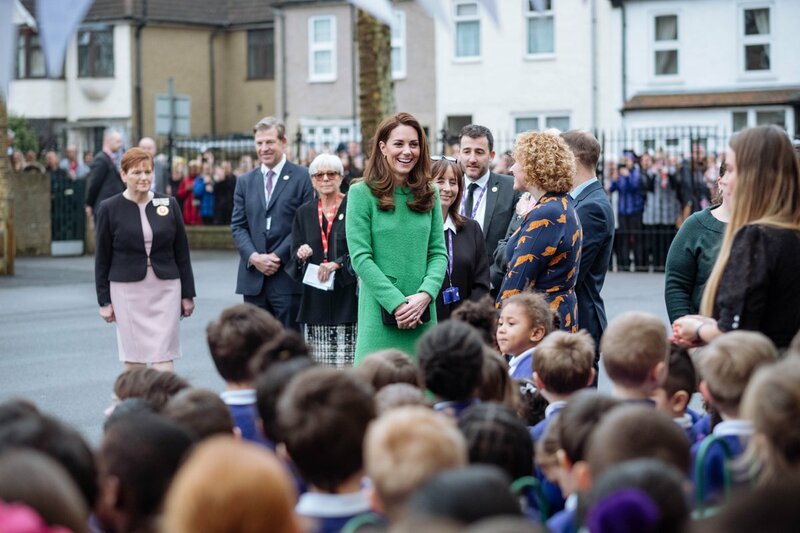 A video of Duchess’ visit to Alperton School. 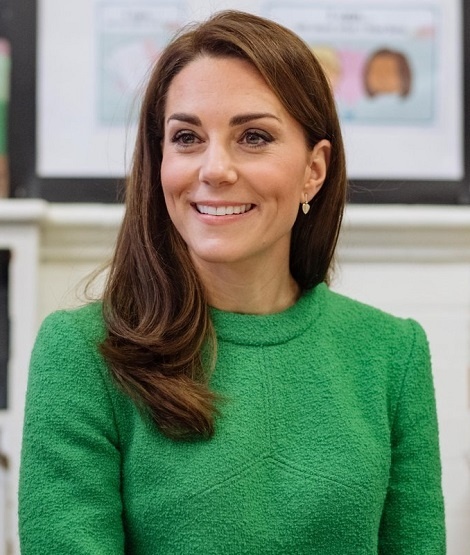 Duchess of Cambridge was wearing a green dress from British Label Eponine London. It looks like she is wearing a bespoke version this pink dress from label’s Spring Summer 2018 collection. 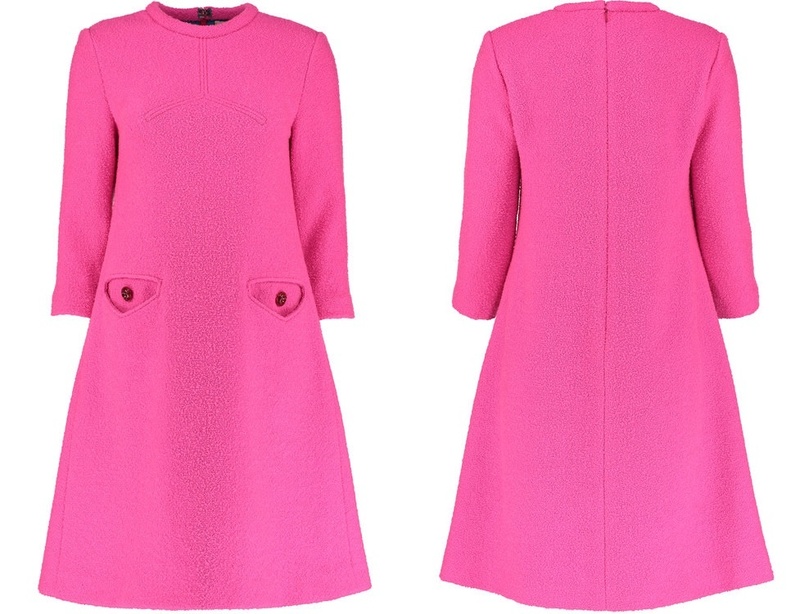 The vintage looking £2,100 dress is crafted from thick boucle wool material and has round neckline full sleeves and an interesting eye-detailing at the pocket lapels. Duchess’s dress has sheath silhouette. 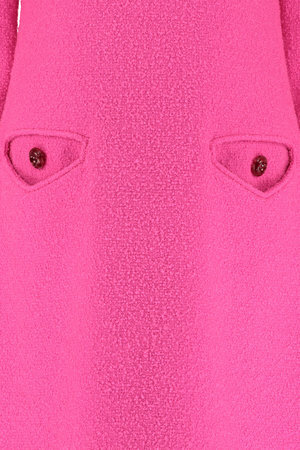 A closer look at Duchess’ dress. Catherine paired the stunning dress with a new pair of shoes. She was wearing L.K. 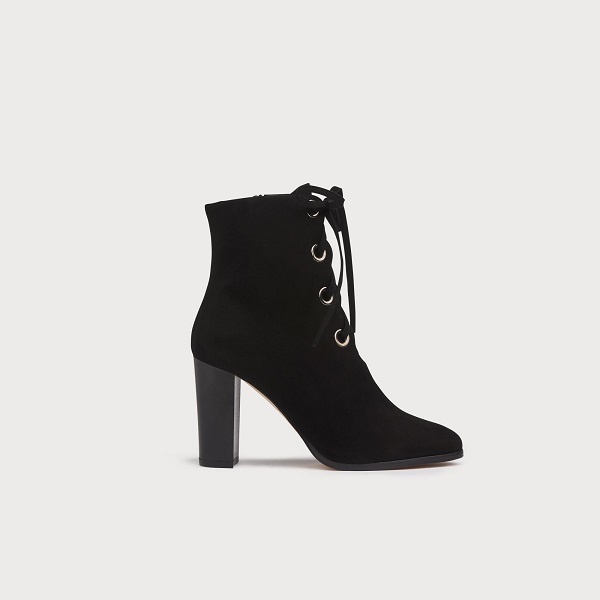 Bennett’s Marissa black suede ankle boots. The originally £295 shoes are now on sale and are retailing for £199. Thanks to jfb_florencia and PamWalters1 on Twitter for the id. The lace shoes are described as, “Our Marissa boot is a lace-up design crafted from super-soft suede. This classic style features four eyelet lacing, an almond shape toe and a high block heel. 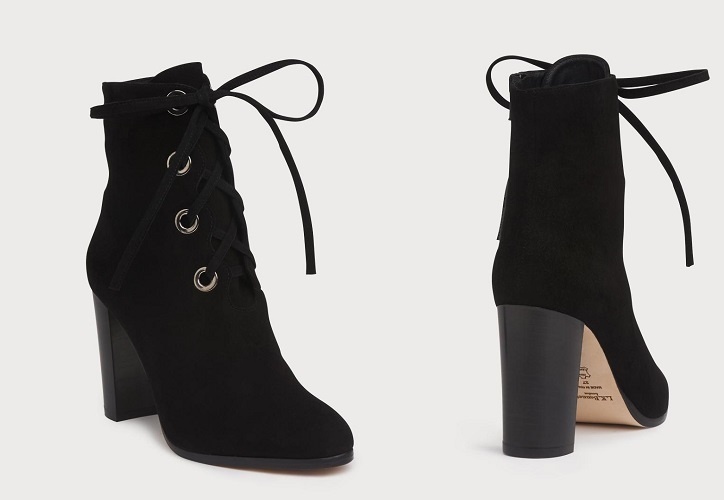 Marissa is the perfect boot for dressing up the simplest of winter looks”. 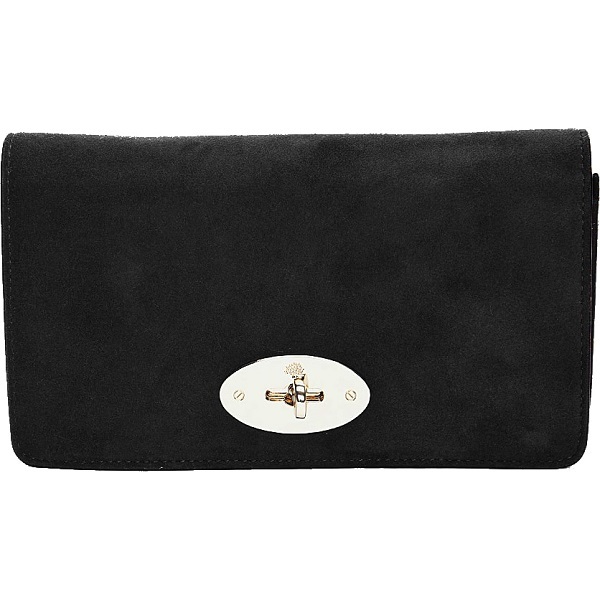 Catherine was carrying her Mulberry’s Bayswater Suede Clutch. 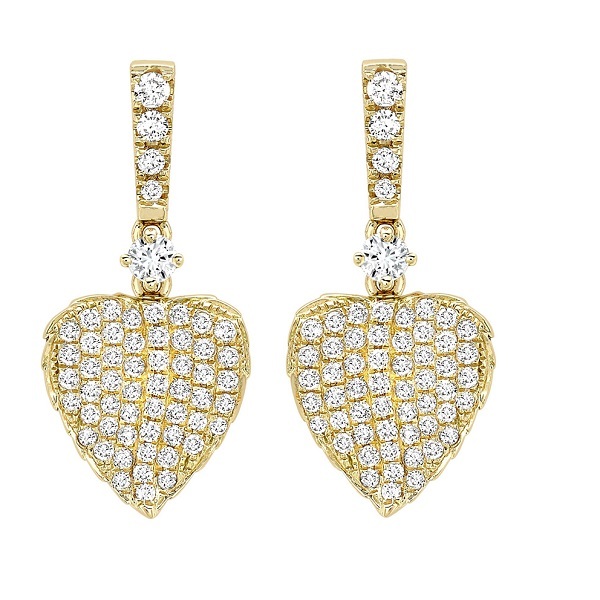 Duchess finished her look with Kiki McDonough’s Lauren Yellow Gold Pavé Diamond Leaf Earrings.